4B. Mill Village Life In Working-Class.. While Black and white workers shared common experiences of adapting to city life, racism and Jim Crow kept neighborhoods separated. In the 1920s American Tobacco was the largest employer in Durham. The campus was flanked by worker housing to the south and west. Many white workers received subsidized housing and other support from their employers. Working-class white people primarily settled around the textile mills in West and East Durham. 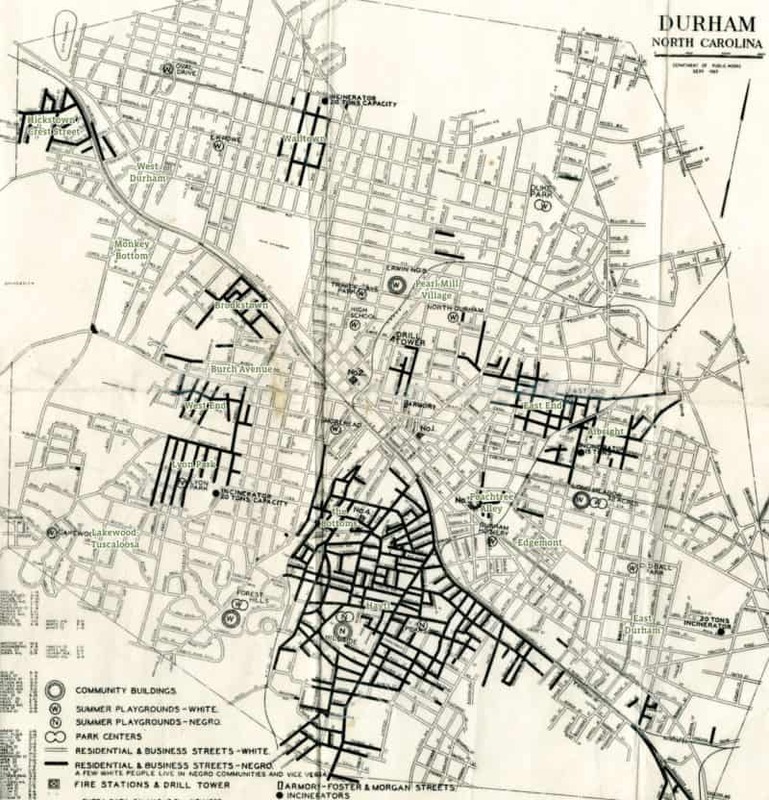 Black workers in racially segregated neighborhoods faced the worst housing conditions. Black people in Durham settled in 5 main areas: Hickstown, Walltown, West End, East End, and Hayti. Hayti was the largest area, where more than half of Black Durhamites lived. This map, created by Durham Public Works Department in 1937 shows Durham’s Black neighborhoods, indicated by thick black lines. 4A. Early Durham Real Estate 4B. Mill Village Life in Working-Class..